Happy-Sad™ 2-sided Flip-Overs® Feedback Magnet Says it All! magnet is right there in your hand to use. Turn it over to show how you feel. 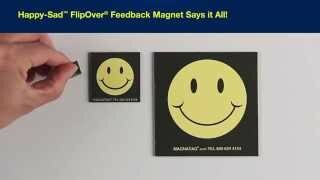 The Happy-Sad™ Flip-Overs® magnet gives silent Feedback on performance results on white board systems (sales, production, etc.) or on any steel surface. One look says it all! Use them on doorways to signal whether or not you want to be disturbed or place one on the employee of the month's office door. Use them on shelves in your warehouse to signal when stock is low or out. Post one on a machine part when it's time for maintenance. Where ever you need to communicate urgency or delight use Magnatag® Happy-Sad™ Flip-Overs® magnets.